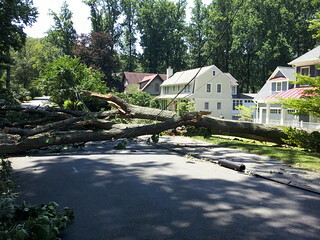 Cleanup from the June 29 storm continues in our neighborhoods and communities. All private refuse collection companies operating in Fairfax County must collect brush placed at their customers’ curbsides as long as the brush is in bundles of less than 4 feet in length, weighing less than 50 pounds and no piece is larger than 6 inches in diameter. For larger amounts of brush or bulk debris, you should contact your trash collection service provider for information about special collections and set-out instructions. For a charge, the county does offer a MegaBulk collection service to collect larger amounts of brush or bulk debris. You may also self-haul large amounts of brush or bulk debris to the county’s recycling and disposal centers at the I-66 Transfer Station or the I-95 Landfill Complex where it can be disposed of for a fee. During the storm recovery the brush disposal fee has been set at $5 per load for residents only. Complete details on tree and debris removal are available online. Additional questions may be referred to the Solid Waste Management Program at 703-324-5230, TTY 711.